Provide comfort for the family of Albert Heinzig with a meaningful gesture of sympathy. Provide comfort for the family of Albert Friedrich Heinzig by sending flowers. It is with heart felt sadness, your church family @ Boom Town Trail Cowboy Church, Elnora, Ab. send you our sincere sympathy. We will always hold dear in our memories, the zip and special zing you, Mabel, and Alberta gave to those wonderful old hymns as we sang our praises to our Lord in those early days of our church's infancy. Without your wonderful contribution of music talents it is doubtful our little church would have survived. We will always cherish those memories as we hope you will. God Bless you Always Mabel, and may he walk with you and guide your footsteps each day. Mary Williams, Past/Trail Boss, on behalf of Boom Town Trail Cowboy Church, Elnora, Ab. Sending our love to Mabel in this difficult time. Our family holds dear many wonderful memories of Albert. 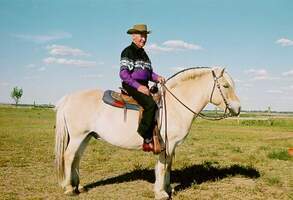 He was a very kind, special person who was a good judge of people and horses. 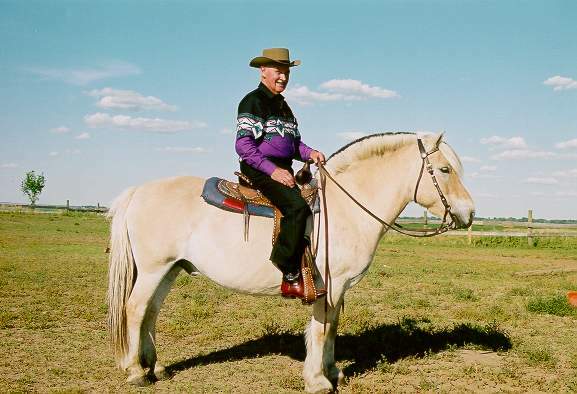 His love for horses was how we came to know you both and we have uploaded a photo of Albert taken on our farm trying out a Fjord horse for a change. We hope the trail rides are long and the sunsets are beautiful in heaven. Love Viggo, Grethe, and Julie Sorensen. We want to extend our sincerest sympathies to you Mabel. We know that you have experienced a great loss but also a great hope as you will be reunited in heaven one day. We have truly been inspired as to how well you worked together; side by side in ministry and as life partners. May you be comforted in these days as the love of your life is gone. Our love goes to you. Love Paris and Heather.